VR/AR is undoubtedly some of the coolest tech on market right now. Read on to see what researchers are doing to make it even better. 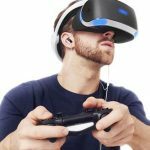 Virtual reality is a topic I’ve touched on an increasing amount in the past year as the number of applications has mushroomed. It seems perhaps that the time has finally come for both VR and AR. One issue that remains to be overcome however is that of eye fatigue, which can make it hard to remain in the digital world for too long. A recently published paper from researchers at the University of Illinois at Urbana-Champaign describes a new type of 3D display that the authors believe solves the problem of eye fatigue. The display measures just 1×2 inches and therefore increases the viewing comfort by providing better depth cues that provide a visual experience comparable to how we see in the real-world. Existing VR and AR environments present 2D images such that our brain is cued to combine them into the 3D environment. It’s a process that causes vergence-accommodation conflict, which can make it harder for us to fuse the images over time, and strains our eyes. The new approach uses optical mapping to present actual 3D images to the user. It works by dividing the digital display into sub panels that each create a 2D picture. These sub panel images are then forged together to appear to the user as though each individual image is at a different depth. The system also uses an algorithm to blend the images and ensure that the depth appears continuous. The system is designed such that it could work with current display technology, but the researchers believe it’s most effective on an organic light emitting diode (OLEDs) display due to the extremely high resolution available. The next step is to further reduce the system’s size, weight, and power consumption before hopefully finding commercial partners to help bring the technology to market.